Decide how you want to organize your data: Do you have multiple unique datasets or only one dataset containing multiple files of data? As the data submitter, you are best suited to make this decision. Try to imagine yourself as a user of your data, and ask yourself what the most useful grouping would be. Remember that you can denote relationships among datasets in the ADC like “Is Part of” and “Cites other datasets.” In this way it is possible to have separate but related records for your data if you feel that is the most appropriate way to represent it. Select “Log in” at the upper right corner of the ADC home page if you are not already logged into the ADC. Select “Submit Dataset” at the upper right of the screen. Now you should be on the “Create Dataset” form. Proceed to populate the fields shown. See our Description of fields on “Edit Dataset” page for detailed explanations of each field. The only difference between "creating" and "editing" a dataset is that you only need to create the dataset once. After you create a dataset, you can then go back at any point and edit the content in the fields. The fields on these pages are exactly the same. Note that the gray rows toward the end of the page (such as “Purpose and Methods” and “Temporal Information”) are expandable. Select each header to view the full range of fields ADC has for describing your data. After you have finished filling out the dataset creation form, select "Save" or “Next: Add data” at the bottom of the screen. If you would like to add your resources at a later date, choose "Save". If you are ready to add your resources now, choose "Next: Add data". If you choose the latter, you should be on the “Add data” form, and are ready to submit your data files and resources. Upload or link to your data files and any related content. Make sure they are named and formatted the way in which you want them to appear. See the Description of fields on "Add Data" page for detailed explanations of each field. 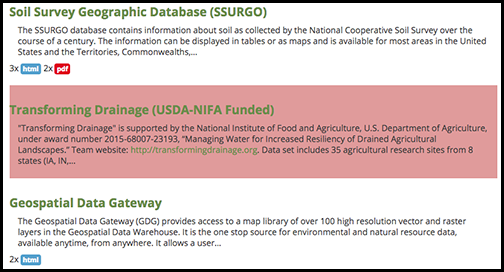 See the Guideline for remote data resources and related content page of this manual for more information on appropriate resource files to upload or link. If you are only adding one resource at this time, when finished, select “Save” at the bottom of the page to save your changes. If you finish adding that resource but want to immediately begin adding another resource, when finished, select “Save and add another” at the bottom of the page to save your changes and add an additional resource. You will repeat this "add data" process and create an additional resource for each data file you upload or each API you link. You can create multiple data resources within each dataset, allowing you to describe each resource more accurately. If you would like to include multiple files in a single downloadable resource, you may upload a single zip file containing multiple data files. If you choose this method of adding your data, please describe the contents of the zip file(s) thoroughly since users will not be able to preview zipped files to the same degree as individual files. Remember to upload your data dictionary as a resource, and check the box titled “Make this resource the data dictionary” near the center of the page. See our Data Dictionary Guidelines toward the end of this document for more information on preparing data dictionaries. You can always return to your dataset to add data and other resources at a later time by using the "+ Add Resource" button at the top left of the dataset page. At this point, you should also decide whether you want your data resource(s) to be published immediately, or if you would like to place an embargo period on the data. An embargo would create a placeholder for your data resource, which will automatically be published when the embargo expires. We allow for resources to be embargoed for up to 3 years. See “Scheduling Options” on the Description of fields on “Add Data” page for more information. Create a new resource for your dataset (see instructions above) and enter a title and description of the data you expect to publish. Upload a data file to accompany this resource record. 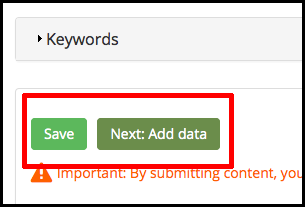 Scroll to the bottom of the page above the "Save" button and click "Scheduling options"
When you view your saved datasets/resources on the ADC Datasets page(s), they will be highlighted in pink. This indicates they are unpublished, nothing else (see example of an unpublished dataset, Transforming Drainage, in the image below). Only you can view unpublished datasets you have created while logged into your user account. In order for your data to be viewed by everyone, you must first submit the dataset for review.